The Italian niche line Memento debuted last year from Eurocosmesi. 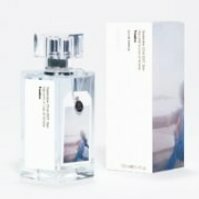 There are two fragrances so far in the Italian Olfactive Landscapes series, both developed by perfumer Marie Salagmagne and meant to "reflect an Italian location at a specific day, time and month". 22 Settembre 2007, ore 8 Vaporetto per il Lido, Venezia (shown) captures the morning air of the Lido in Venice, and features notes of sea breeze, salt, star anise, peony, black bog-rush, sand accord, sandalwood, patchouli, amber and musk. The fragrance launched in Italy last year, and is available in 50 ml Eau de Parfum. 6 Marzo 2008, ore 11 - Piazza Duomo, Ortigia, Siracusa – Sicilia launches this month, and captures spring in Sicily on the island of Ortigia with notes of neroli, freesia, jasmine, helichrysum, hay, cedar, amber, patchouli, myrrh and agarwood. It launches this month in 50 ml Eau de Parfum. Update: The Memento line is now called "Made in Italy". The Siracusa notes sound promising but black bog-rush in the Venezia one? Um, what is black bog-rush? I've been lucky enough to be in Venice in the winter when it was so atmospheric and the canals didn't smell bad as I understand they can do in the heat of summer. Hopefully it is the cool weather Venice which is intended to be evoked here! Schoenus nigricans, or black sedge — and that is all I know about black bog-rush! I was in Venice in Sept, it was what I'd call mildly aromatic. Didn't bother me in the least. Don't know what it's like in July & August. I visited Venice in December, when it didn't smell of anything apart from pizza. But the sense of being somewhere not quite part of the real world was simply magical. Let's hope this perfume can capture that! Venice is other-worldly, I think of it as Disneyland for grown-ups. Would love to go back, haven't been in a VERY long time. I get the black-bog in Venezia, but not the sand accord. I used to visit Venice regularly (had a Venetian BF) and I don't ever recall smelling or seeing sand. Maybe in Murano on the western side. Hmph. Definitely worth a try, anyway… just hope it's nothing like Deseo or Sand & Sable. Yes, I was rather wondering about the sand accord bit if we're talking about the Lido. Hmm. I was in Venice for a week and never went to the Lido, but I understand the Lido is essentially a sandbar, and does still have sandy beaches. I was there in Late July when the temperature got soooo hot that people were passing out on the vaporetto (my better half included). The smell was… “not terrible”, but I certainly do not recall star anise, poeny, sandalwood, patchouli, or amber! Musk, yes! And lots of it, but not the others stuff… either September 22, 2007 was very different, or Ms Salagmagne has a vivid imagination. Wow, that is hot! We'll have to assume it was much cooler on that particular 9/22.